Paul Burrell was a servant to the Royal Family. At first a personal footman to the Queen, he became the butler and confidante of Princess Diana. It is extraordinary how similar his chart is to Diana’s. Both Burrell and Diana have the Sun and Mercury in the 7th. They both have the Moon in Aquarius in a similar area of the chart and an opposition between the Moon and Uranus in the 8th house. They also have a square from Uranus to Venus in Taurus in the 5th house. As these are the most critical placings in Diana’s chart, it’s scarcely credible that they could be exactly the same in the chart of her most devoted servant. It seems that Paul Burrell’s claims to be Diana’s trusted confidante are confirmed astrologically. 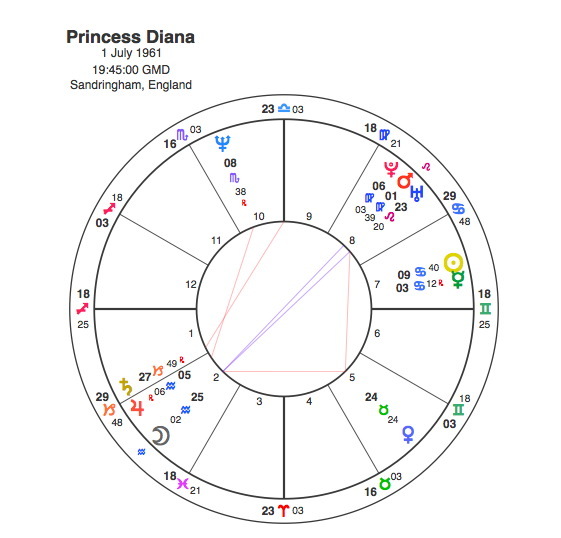 As his chart is so similar to Diana’s it needs to be read in such a way that many of the symbols have to actually represent her. Burrell’s Sun is in Gemini in the 7th house and it could be that the main theme in his life was as counsellor to Diana about her relationships or in writing about them in his own controversial autobiography ” A Royal Duty “. The Sun is in opposition to Saturn so his role in writing the book brought him a lot of opposition in the media and from the Royal Family. He also has two T Squares which is always the sign of a person facing a lot of challenges in his life. One is based on Venus in Taurus in the 5th house, which as Diana’s T Square apex planet must represent her. Venus is opposite to Neptune in the 11th house which probably represents Burrell’s role as a devoted servant ( Neptune ) and friend ( 11th ). This opposition focuses onto an apex Uranus in the 8th house, which symbolises Diana’s sudden death. The other T square is based on an opposition between Burrell’s Scorpio Ascendant and Mercury in Gemini in the 7th, which again probably represents Diana’s changing relationships. This opposition focuses onto Pluto ( the planet of death ) in the 9th house ( in a foreign land ). It may seem strange to be giving so much emphasis to another person in Burrell’s chart, but as a servant we know very little about his actual character but we do know something of the role he played in the Princess’ life and after her death. 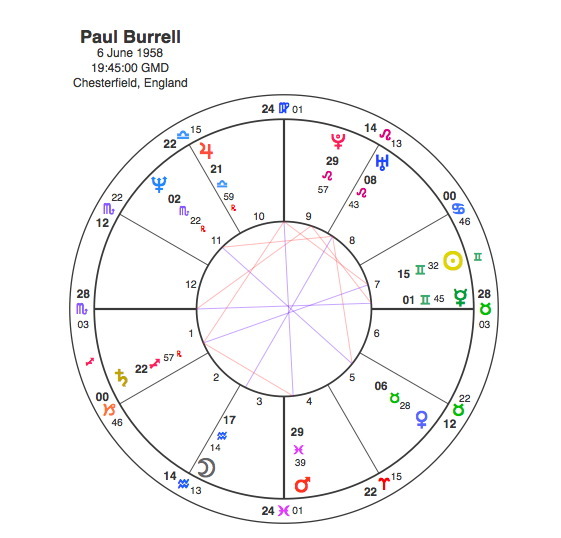 It’s common that actors who are strongly associated with a particular part will have that role described in their chart so the same applies to Paul Burrell. In 1984 Burrell married Maria, who was a servant to Prince Philip and in 1986, the couple joined the household of the Princess of Wales, he as butler and she as maid/dresser. Pluto was in his main T Square conjunct Neptune opposite Venus and square Uranus between 1984 and 87. The transit to Venus symbolised both his own marriage and his employment with Diana. He became close to Princess Diana, and he was devastated when she died in August 1997 and Uranus, the planet that symbolised her death in his chart had moved to opposite its natal position turning the T Square into an extremely difficult Grand Cross also in square to Venus. In January 2001, he was arrested and accused of stealing over 300 items, including clothes, music CDs and LPs, photographs and letters and a valuable boat model encrusted in jewels, from the Princess of Wales’ personal belongings. He was acquitted in November 2002 when it was revealed that he had told the Queen he was keeping some of the Princess’ belongings and the Palace dropped charges. His book came out in at the end of 2003 and was published in paperback in 2004. From 2001 – 2005, Pluto was opposite his Gemini Sun and conjunct Saturn, a perfect symbol of his writing a book ( Gemini ) and his trouble with the accusations ( Saturn ). Paul Burrell was certainly a devoted servant and trusted friend of the Princess of Wales. This role brought him much heartache and opposition from many quarters when he wrote about it. But anyone who had a chart so similar to Diana’s was bound to have their fair share of both publicity and suffering.